Patricroft Basin and Warehouse is a place on the waterways minor waterways place place on the waterways major waterways place village town city on the Bridgewater Canal (Stretford and Leigh Branch) between Barton Swing Aqueduct (Manchester Ship Canal crossing) (2¼ furlongs to the southeast) and Quayside Winding Hole (8 miles and 2¼ furlongs to the west). The nearest place in the direction of Barton Swing Aqueduct is Barton Yard; 1¼ furlongs away. 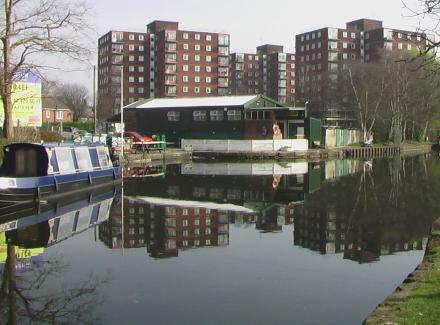 The nearest place in the direction of Quayside Winding Hole is Patricroft Bridge Winding Hole; 1¼ furlongs away. Lease4Less, Repeat House, Bright Road, Eccles, Manchester, M30 0WG — 1097 yards to the northeast. New Hall Farm Liverpool Road, Manchester, M30 7LJ — 1587 yards to the southwest. Eccles — 1100 yards to the east. Trafford Quays Leisure Village, M41 7JA — 1420 yards to the south. Grand union way, Manchester, M30 — 591 yards to the southeast. Manchester, M30 0SF — 863 yards to the north. 2 City Approach, Albert Street, Eccles, Manchester, M30 0BL — 1514 yards to the northeast. Manchester — 261 yards to the southwest. 193 Monton Road, Monton, Eccles, Manchester, M309PN — 1524 yards to the north. BEYOND, Trafford Quays Leisure Village, Manchester, M41 7JA — 1371 yards to the south. Manchester — 1265 yards to the northeast. 36 Barton Lane, Eccles, M30 0EN — 1231 yards to the east. Manchester — 1182 yards to the northeast. Regent Cres., Stretford, Manchester, M17 8AA — 1625 yards to the south. Green Lane, Manchester, M30 0GX — 787 yards to the north. trafford blvd, Manchester, M17 8AA — 1173 yards to the south. Barton upon Irwell — 750 yards to the northeast. Manchester — 556 yards to the east. Manchester — 531 yards to the southeast. Manchester — 1086 yards to the north. 3 Lyntown Trading Estate, Manchester, M30 9QG — 1155 yards to the northeast. Trafford Way, Trafford Park, M41 7 — 1343 yards to the south. Manchester — 1137 yards to the east. Venus, No1 Old Park Lane, Trafford City, Manchester, M41 7HA — 1182 yards to the south. 36 Barton Lane, Manchester, M30-0EN — 1231 yards to the east. Manchester — 148 yards to the southeast. 7, Trafford Way, Trafford Quays Leisure Village, Manchester, M41 7JA — 1258 yards to the south. Unit 4, James Nasmyth Way, Eccles, M30 0SF — 880 yards to the north. Manchester, M30 9L — 1473 yards to the north. Old Park Lane, Manchester, M17 8PG — 1535 yards to the south. Bridgwater Mill, Legh Street, Eccles, M30 0UT — 434 yards to the northwest. The Trafford Centre, Manchester, M17 8 — 1347 yards to the south.